an electric power plant that converts the energy of sea tides into electric energy. A tidal power plant utilizes the difference in the water level during high and low tides. When a dam closes off a bay or the mouth of a river that flows into the sea or ocean, a reservoir, called a tidal power plant basin, is formed. If the high tide is of sufficient amplitude (> 4 m), enough pressure may be produced to rotate hydroturbines and connected hydroelectric generators installed in the dam. A tidal power plant with one basin, operating on a regular 12-hour tidal cycle, can generate electric power uninterruptedly for four or five hours four times a day, with corresponding intermissions of one to two hours. (Such a tidal power plant is called a single-basin, two-cycle plant). To eliminate nonuniform power generation, the basin of a tidal power plant may be divided by dams into two or three smaller basins. In the first basin the water level is maintained at low-tide level, and in the second at high-tide level; the third basin is a reserve basin. The hydroelectric generator is installed inside the separating dams. However, even this design does not completely eliminate the power pulsations caused by the cyclic nature of tides over a half-month period. When a tidal power plant is included in the same power system with other, high-power thermoelectric power plants, including nuclear plants, the energy generated by it can help supply the peak demands of the power system. If the system includes hydroelectric power plants with reservoirs for seasonal regulation, a tidal plant can compensate for the fluctuations of tidal energy occurring during the course of a month. Capsule hydroelectric generator units installed in tidal power plants may be operated with relatively high efficiency in direct or reverse generator and pump systems and as apertures for the flow of water. 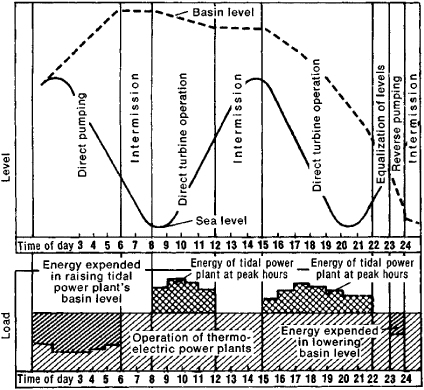 During the hours when a low-load period of the power system coincides with the low or high tide, the hydroelectric generators are either turned off or function as pumps, directing the water into the basin above the high-tide level or from the basin below the low-tide level. Thus, energy accumulates until the time of peak demand (Figure 1). When the high or low tide coincides in time with the maximum load of the power system, the tidal power plant acts as a generator. Thus, it can be used as a standby electric power plant. The 240-megawatt tidal power plant at the Rance River estuary in France, built in 1966, operates in this way. Utilization of tidal energy is limited mainly by the high construction cost of tidal power plants: the construction cost of the Rance plant was almost 2.5 times that of conventional fluvial hydroelectric power plants of equal power. The USSR has been an innovator in reducing construction costs by successfully building a hydroelectric power plant together with a tidal power plant by the floating construction method, generally used for such maritime hydroengineering structures as tunnels, docks and dams. With this method, the structure’s components are constructed and adjusted at a maritime industrial center. The structure is then assembled and towed on water to its final site. The first experimental tidal power plant in the USSR was built by this method at Kislaia (Shalimskaia) Guba of the Barents Sea between 1963 and 1968. The plant’s structure 36 (X 18 X 15 m) was built of thin-walled components (15–20 cm thick) combining high strength with low structural mass. It was erected on a foundation area on Kola Gulf, near the city of Murmansk. After the equipment was installed and the building tested for waterproofness, the foundation area was submerged, and the building was floated out to sea and towed to the narrow neck of Kislaia Guba. There, during low tide, the building was set on a submerged foundation and connected by dams to the shore. This structure closed off the neck of the bay and formed a tidal power plant basin. Two reversible hydroelectric generators were installed at this plant, each with a capacity of 400 kilowatts. The power plant went into operation on Dec. 28, 1968. The construction of the Rance and Kislaia Guba tidal power plants and the experience gained from their experimental operation have made it possible to plan the following tidal power plants: the Mezen’ plant, on the White Sea (6-14 gigawatts); the Penzhina (35 gigawatts) and Tugur (10 gigawatts) plants, both on the Sea of Okhotsk; and the plants on the Bay of Fundy and Ungava Bay in Canada and at the estuary of the river Severn in Great Britain. Bernshtein, L. B. Prilivnye elektrostantsii v sorvremennoi energetike. Moscow, 1961. Kislogubskaia prilivnaia elektrostantsiia. Edited by L. B. Bernshtein. Moscow, 1972. Tidal Power. Edited by T. K. Gray and O. J. Gashus. New York-London, 1972. Its tidal power plant, Deep Green, resembles an underwater kite and is based on an innovative new approach for generating electricity, capable of producing 10MW of electricity - enough to power 8,000 homes by 2020. The La Ranee Tidal power plant in France was built between 1960 and 1966. Nova Scotia is already home to North America's first and only tidal power station--2014 marks the 30" anniversary of the start of operations at Nova Scotia Power's Annapolis Tidal Power Plant. The Narec facility provides us with the opportunity to perform extensive characterisation and endurance testing of our latest tidal turbine power trains, and this complete water-to-wire system validation will serve to prove the quality of the design prior to deployment in tidal power plant arrays. Earlier this year Dr Gokhman published an article in International Water Power andDamConstruction magazine, in which he argued that a two-way tidal power plant equipped with the right sort of turbines could generate two-and-ahalf times as much electricity as the scheme examined by DECC, at only 10% greater cost. That left the tidal energy field wide open, and in 1967, France succeeded in building the world's first tidal power plant. Balanced against the possibility of a second nuclear power station, a tidal power plant may be the lesser of two evils, and Milner is keeping an open mind on the matter. Bedard, speaking recently in Nova Scotia, said a tidal power plant in the Minas Basin could accommodate 250 turbines and would cost $4. The construction and operation of a tidal power plant is however much more complex than a hydro plant on a river.